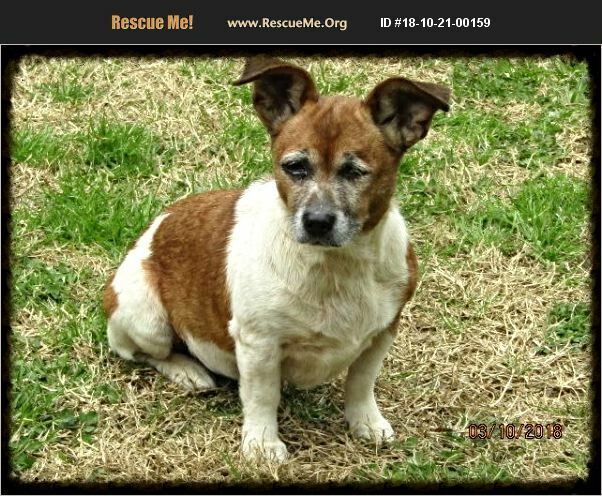 dob: 2/17/2011..rescued from 'high-kill' Laurens Co, SC Animal Control after Mitzi was brought in as a 'stray'. We are convinced that she was owned by an older woman who just opened her door and let her out to go potty, and the woman may have gone into a nursing home or hospital and couldn't go looking for her Mitzi. Mitzi is a JackRussell/ChihuahuaX, with a bobbed tail and weighs just 10lbs. She is a devoted companion to her person. LOVES going for car rides, sleeping snuggled up against her person, walks well on-leash and is a great 'watch dog'. Protective of her food dish, so must be fed in separate corner from any other pets. Gets along with all size dogs, though seems a bit jealous of some older small females. Maybe had some competition, in her past life? Has the Jack personality, with short little legs. adoption fee: $95(includes spay, micro-chip, parasite-free, current on monthly heart worm and flea/tick prevention, health certificate issued within 3 days of transport, Martingale collar w/matching 6' leash, beef knee cap chew bone and all medical paperwork from day#1 with Howlin4Spirit). This pup is in and will remain in Rutherfordton,NC until her fur-ever family/home is approved. Transport from western NC to VA/DC/MD/DE/NJ/LongIsland=$100 & RyeNY/JohnstonRI/ManchesterNH/Allentown,Annville,HarrisburgPA or ChambersburgMD=$125 via Happy Dogs OR Lifesavers Rescued Pet Transport services with Saturday deliveries ONLY! To apply to adopt, please go to www.howlin4spirit.org/adoption-application/ and COPY & PASTE the application in to a new email, go to the end of each question and answer thoroughly, to help us understand your family, environment, habits and abilities so that we can match you with the right fit for a companion animal. Send your completed application(don't forget EMAIL ADDIES for your 3 UNrelated-to you and each other) to howlin4spirit@gmail.com. We will be happy to send you more pix & videos upon request.